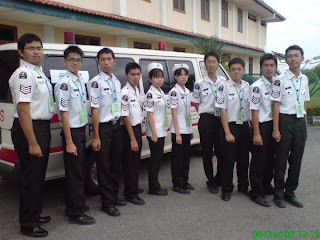 6 - 9 Dec 2007 - I joined the NCO Cadet Camp 2007 organized by the headquarter of St. John Ambulance Malaysia Perak Central Area. The camp was held in SMK Sentosa, Kampar, Perak. We went there by bus. There are approximately 132 members joining and 50 organizing team members. There are 10 groups in this camp whose name are based on the 12 horoscope. I'm from group Capricorn and my teammates are Beh Ching Siong (L), Leong Siew Yin (A.L), Leong Weng Siang, Chin Zhee Yuen, Cheah Ying Kang, Wong Jin Yuen, Looi Kar Yee, Chin Choi Hui, Hing Chen Yee, Teoh Ting Yuen and Yeoh Pei Ying. The Camp Commander of the camp is Mr. Lim Jit Theam while the Asst. Camp Commander is Mr. Yow Weng Kit and Ms. Song Ching Ling. Throughout the camp, we've learned alot of new things from our fasilitator, SGT Tean Zi Yong and gained experience. Besides that, this camp also offered us two badges, the CADET CAMP COURSE badge which are given to us for free and the ORDER OF ST JOHN badge. What I can say is 80% of the things we learned here cannot be learned from school. The punishment here is eXtremely less compared to my school. The third day of the camp, we played for the Commando Cross games which consists of 10 station. Later at night, we've our drama/presentation. My team drama's title is Money Love Money (Love Story). The last day of the camp is the day we wont forget. We had our feedback time and awards. The best team goes to group Cancer, the best male camper goes to Tean Zi Yuen, best female camper goes to Cheah Pui Yen and the best leader ..... (forget). I reach HQ by 6pm that day. This signal the end of the camp but the fellowship of our team will never die! Hello. I find your blog very interesting. NCO Financial Systems is a company that provides different services of financial nature. NCO's tagline is: "Helping Business Process". Their primary aim is to provide their customers a possibility to find right people, right place and right implements to satisfy their business process outsourcing needs. I found this information on this great site www.pissedconsumer.com.